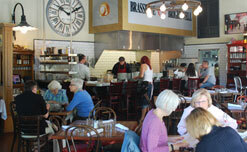 Merchants at Easton Market Square bring you a small town gourmet experience. From farm fresh produce to exotic flowers and savory treats to fine dining, Market Square brings you diversity and an experience to remember. Roger Cole is an internationally recognized orchid hybridizer who focuses on growing plants that you are unlikely to find anywhere else. 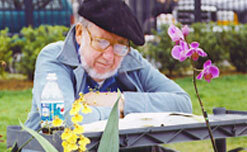 Orchids are Roger’s passion and he grows more than 4,000 of them in his Queen Anne, MD greenhouses. At Easton Market Square you’ll fine a wide variety of flowering and occasionally non-flowering orchids to choose from. The orchids are always beautiful, occasionally curious, and never leave the shop without complete printed instructions for their care. Roger is always glad to share his 40 years of growing experience, which includes time spent as the president of The Orchid Society and chairman of the American Orchid Society judging center. Stop by for a chat and pick up tips for keeping your orchids thriving. 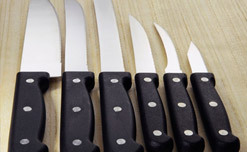 Get your knives in top shape with Bob. Your beloved knives cut and chop all day long, and as a result lost their sharpness. Chefs and gardeners alike knowBob will get your tools back in shape. From the owners of Easton's 208 Talbot, comes a casual, French-inspired restaurant. Brothers-in-law Brian Fox and Brendan Keegan have established a true gem with a diverse menu that includes meats and fish from the grill, hand-cut, homemade French fries, French-inspired hors d'oeuvres, a raw bar and soups and salads. Brasserie Brightwell is located in the back of the Harrison's Liquors building. There’s an art to making the perfect crepe and Gerrit Marks has mastered it. 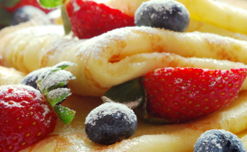 Starting with a top-of-the-line French griddle, he swirls, flips and folds his way to delicate perfection every time. Freshness is paramount at Chez G. Gerrit sources the fillings for both savory and sweet crepes from local farmers markets and growers. Traditional French sandwiches, including Croque-Monsieur, are also available. World class chocolates from California & France are another Chez G specialty. Chocolate connoisseurs recognize brands like John Kelly Chocolates, Lillie Belle, Santa Barbara Chocolates, and Valhona as the best of the best. Coming Soon - grilled marinated portobello "steaks"
Drive through our coffee kiosk for a steaming cup of freshly brewed coffee or a refreshing cold drink. Add a breakfast pastry or cookie and you’re ready to roll again. Cottingham Farm of Talbot County produces a wide variety of organic crops including heirloom tomatoes, arugula, mizuna, tatsoi, red, green, orange, yellow and silver chard, green, red and blue kale, spinach and collards, three colors of beets, red, yellow and orange carrots, as well as french and asian heirloom winter squashes and radicchio, dandelion and chicory. 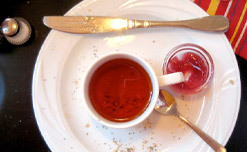 Come join us for a cup of tea! Easton Teas supplies a full line of traditional, specialty blend and herbal teas guaranteed to uplift your day. Stop by! 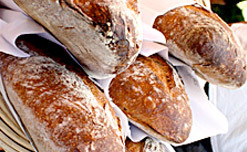 Evergrain Bread Company specializes in artisan breads and pastries crafted in the European tradition. Our mission is simple — produce an honest loaf through the use of quality ingredients and the age-old method of long fermentation. Avoiding the short-cuts and pre-mixed ingredients used by many American-style bakeries, we invest our time and skills to evoke the fullest flavor from the grain. Gourmet by the Bay will help you create a one-of-a-kind experience friends and family will never forget. Our talented team will assist with all the details, from conception to flawless execution, resulting in an event that is a true reflection of you. Harrison’s has been a fixture at the corner of Harrison and Washington Streets for decades. Now under new management, Easton's grand old liquor store has more to offer than ever. 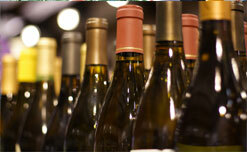 At Harrison’s you’ll find a broad selection of classic wines, your favorite beers, and the most complete assortment of fine liquors on the shore. Harrison’s party kegs and snacks make backyard entertaining a snap. 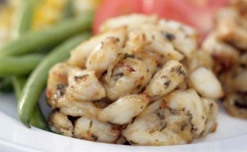 Kent Island Crab Cakes are for those who seek quality crab cakes made exclusively from crabmeat of the Blue Crab – as much as possible from the Chesapeake Bay. Our goal is to serve those customers who demand the finest "Maryland Style" crab cakes available, made by hand right here in Maryland. We love all flowers, especially fresh, local garden and wild flowers with their delicate fragrances. 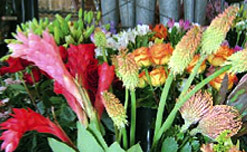 We offer a unique variety of rich, deep colors and all manner of arrangements. 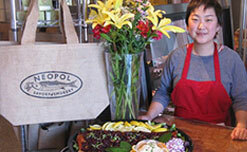 Neopol, a Baltimore favorite for over 25 years, offers the finest fresh smoked foods this side of Seattle. 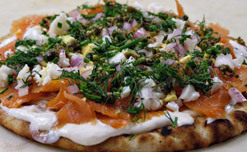 Famous for their custom smoked meats, fish and shellfish, Neopol also offers handcrafted savory pies, freshly prepared seafood & chicken salads, house-cured grav lox, and smoked vegetables and tofu. Enjoy Neopol’s crepes, sandwiches, or salads for lunch or dinner on the Market’s patio or surprise your family with a truly unique take-out meal. Neopol is committed to freshness and that means dozens of smoked savory items change with the season. 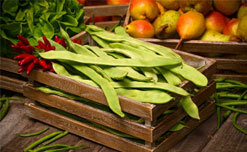 It also means that locally-sourced, organic ingredients are a priority. Neopol takes special pride in its party platters and always encourages taste tests. 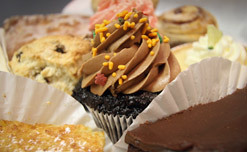 Patisserie Patrice specialized in delicious, handmade gluten free pastires. Come taste our lemon bars, brownies, raspberry granola bars, chocolate chip cookies, and more. 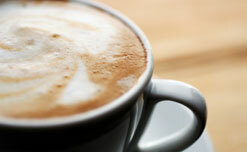 Come see us have a latte or cappiccino! 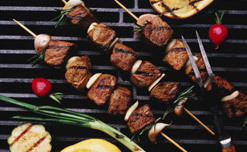 Stop by our mouth-watering booth for delicious, down-home barbeque. We'll be sure to have you asking for seconds so you can lick your fingers twice. Come on in to find out why the word is spreading about our spectacular eats! Begin the adventure by exploring the finest in savory spices, gourmet teas and seasonings. 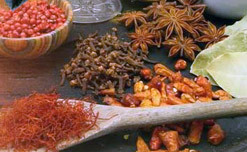 Our cooking herbs, spice blends and rubs are hand-selected for your cooking pleasure. Our gourmet teas are enjoyed by tea lovers across the nation. A culinary delight awaits you in our shop! 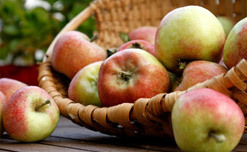 TS Smith is best known for their fresh and tasty apples and juicy sweet peaches. You'll love the fresh seasonal vegetables including tender asparagus in the spring, sweet corn and cantaloupes in the summer, and pumpkins and squash in the fall. Established in 1907 by Thomas Sterling Smith, today the farm is one of only two orchards remaining in the state of Delaware.